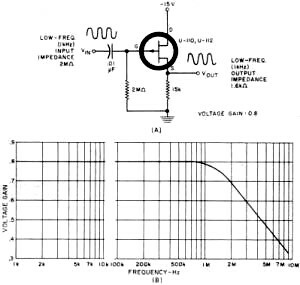 If you are just entering the field of electronics, the concepts presented in this 45-year-old article for basic field effect transistors are still relevant. Significant improvements has been made since then, but the fundamentals stand. 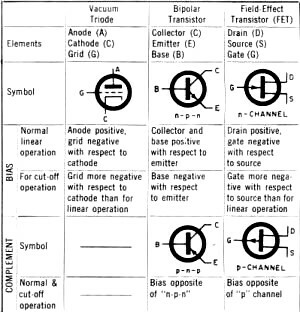 One of the most useful items in this article is Table 1, which compares and contrasts vacuum tubes, bipolar junction transistors, and field effect transistors. A grouping of six simple, low-cost circuits that illustrate many of the principles of FET operation. One of the most important new semiconductor devices is the field-effect transistor (FET). This article describes six low-cost circuits which may be built to demonstrate the important properties of FET's. The U-110 and/or U-112 p-channel FET's are used in the circuits discussed and are relatively low priced. Siliconix has offered the U-110 and U-112 together as a package for $2.75. The U-110 may be had alone for $1.00 under this offer. The industrial-type FET's, U-146 and U-147, are slightly higher in price. The bipolar transistors used are General Electric epoxy devices which sell for $0.50 to $1.00 each. For convenience, the similarities among vacuum tubes, transistors, and FET's are given in Fig. 1. We must recognize the inherent differences which exist among vacuum tubes, transistors, and FET's and the table serves only as an aid in pointing out bias polarities. Fig. 1. 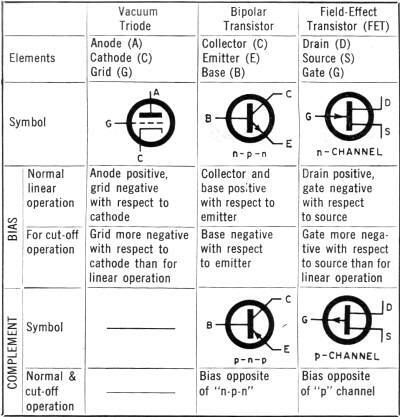 Tabular comparison of tubes, transistors, and FET's. The FET resembles the vacuum tube in that the impedance looking into the gate is very high and can be on the order of hundreds of megohms. 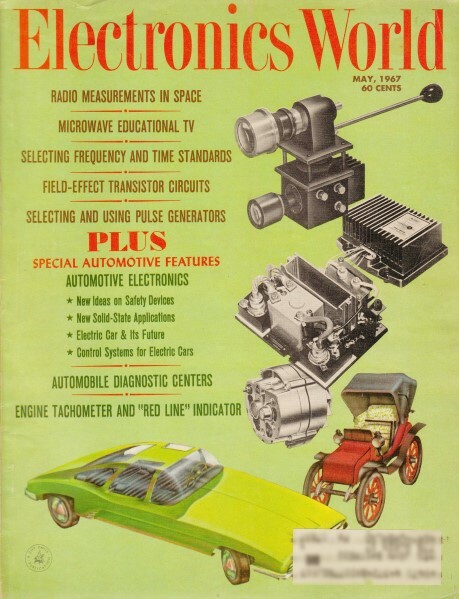 Also, the FET is a low-noise device, better than bipolar transistors and competitive with vacuum tubes. On the other hand, FET's resemble transistors in the leakage currents which flow between their electrodes when the device is cut-off. The source-follower circuit is analogous to the vacuum-tube cathode-follower or transistor emitter-follower. We might expect similar behavior from these circuits and such is the case. We thus have high input impedance, relatively low output impedance, and a voltage gain that can be made very close to unity. Fig. 2 shows a simple source-follower circuit and the bandpass characteristics obtained with two different FET devices. The 2-megohm resistor establishes the gate bias and is similar to the grid-leak resistor used in tube work. However, this resistor must be made small enough so that increased leakage current between the gate and source will not drastically change the bias. For the U-110 and the U-112, leakage between gate and source at room temperature is on the order of 5 nanoamps (5 x 10-9 amp), so a 1­or 2-megohm resistor is adequate. Fig. 2. 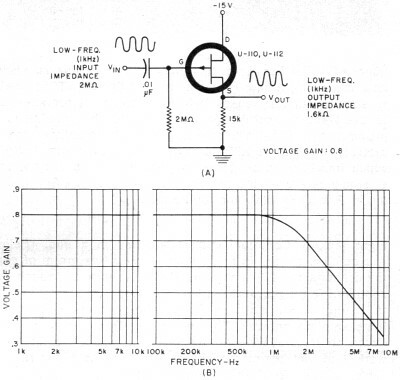 A source-follower circuit along with frequency response. At elevated temperatures the increase in leakage current would dictate that a smaller resistor be used so as to reduce changes in bias with leakage current. It is possible to bias FET's so that very small temperature drift results. The common-source circuit is analogous to the common-emitter transistor and common-cathode vacuum-tube circuits. Again, properties of this circuit are similar to the transistor and tube counterparts. Input and output impedances are intermediate in value and a voltage gain greater than unity may be realized. Fig. 3 shows a common-source circuit and the bandpass plot obtained by using either the U-110 or U-112 FET. Fig. 3. 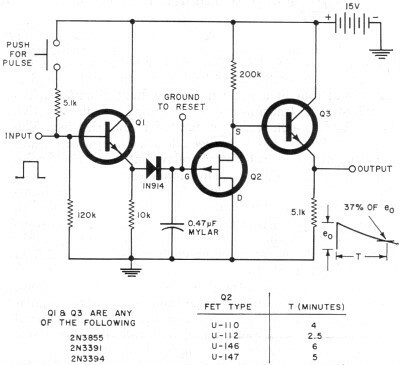 Common-source FET amplifier circuit along with response. The very high input impedance of the FET enables us to build the simple Miller oscillator of Fig. 4. The high impedance of the gate circuit results in light loading of the crystal. The LC combination in the drain circuit is tuned to resonate slightly below the parallel resonance of the crystal. For the type of devices considered in this article, the upper limit of frequency operation is only a few megahertz. For crystals other than the 512-kHz unit shown, the LC combination must be changed accordingly. Fig. 4. 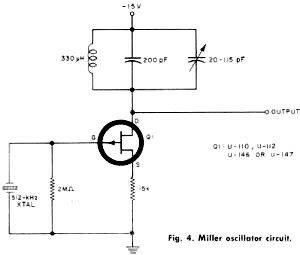 Miller oscillator circuit. The output of the oscillator will not tolerate much loading, but the source-follower circuit can be used as a driver to provide low output impedance without loading the oscillator stage excessively. With differences in FET types and layout details, some modification of the LC network may also be required. For the circuit we tested, "clean" oscillations were observed for the four FET types indicated on the figure without retuning the circuit, and with the supply voltage varying from 6 to 22 volts. A circuit which performs like an improved source-follower or emitter-follower is shown in Fig. 5. The FET again provides very high input impedance, while the transistor output provides low output impedance. 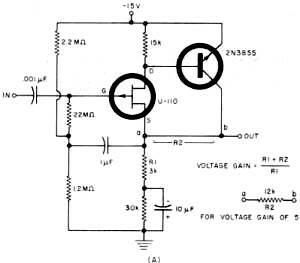 Unlike the source-follower or emitter-follower, this circuit can be built to have a voltage gain greater than unity. This is accomplished by a resistor in the feedback path as shown in Fig. 5A (lower right). Fig. 5B gives the bandpass characteristics when used with a voltage gain of unity and with voltage gain greater than unity. The bandwidth is dependent upon the impedance of the driving source. 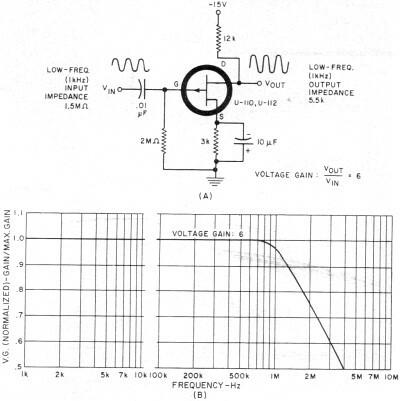 When driven by a 600-ohm test oscillator, the upper 3-dB point is 2 MHz. Bandwidth decreases as the driving source impedance increases. 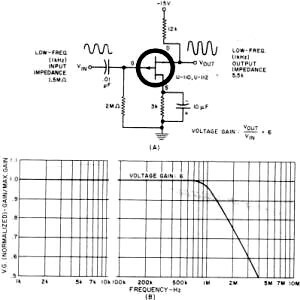 At low frequencies the amplifier input impedance is about 100 megohms and the output impedance is less than 2000 ohms. Fig. 5. FET/Transistor pair has gain and high input impedance. Fig. 6 shows a stretcher which senses the peak amplitude of a pulse and holds this voltage level for a time much longer than the width of the pulse. The diagram includes a push-button to provide the pulse, but of course the pulse could be coupled in from a suitable external source. Fig. 6. Pulse-stretcher circuit with FET and transistors. 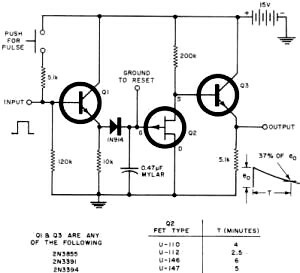 The time constant can be increased by using an FET having a very low gate leakage and by selecting a diode and a capacitor with very low leakage. By using these more expensive components, FET stretcher circuits with output pulse times as long as 30 hours have been built. 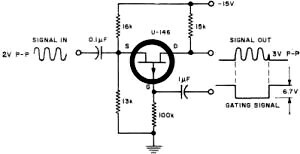 The circuit can be used as a peak-amplitude detector or to obtain a required time delay. Reset is accomplished by either allowing the output to decay or by shorting the capacitor to ground. The FET can also be used as a linear gate or electronic switch as shown in Fig. 7. The resistance between source and drain with the switch "closed" is approximately 1/gm. With the switch "open", only a small leakage current flows between source and drain. This type of circuit can also be used as an amplitude modulator. Fig. 7. A linear gating or amplitude modulator circuit. We have presented six simple, low-cost circuits that illustrate many of the principles of FET operation. These circuits are designed to furnish an understanding of the devices and to stimulate thinking toward other applications. The authors wish to acknowledge the cooperation of Mr. Charles MacDonald of Siliconix, Inc. and Mr. Al Kenrick of General Electric Company.